Zea Mays L / Cornfield. 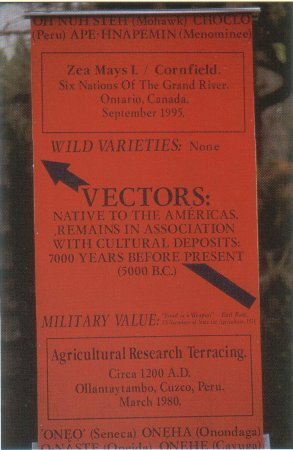 Six Nations Of The Grand River. Art Exhibition: Foodculture" Artlab project, University of Western Ontario, London, ON, 1998. (Group Exhibition. Artlab A / Visual Arts Department; Commissioner Barbara Fischer). 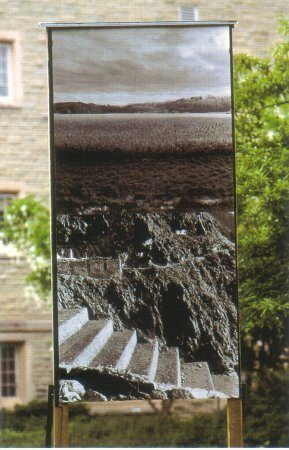 Art exhibition: Garden installation at the University of Western Ontario, London, 1996/1997 to 1997/2001. (Artlab / Visual Arts Department; Commissioner Barbara Fischer). Art exhibition: Trans/mission: Corn Vector. A photographic installation in a garden, in the back of AXENÉO7. From June 14 to September 30, 2008.